Well, today is Halloween. We used to get really into making sure we had costumes and such, but then we were in church for 15 years and the type of churches we went to did not celebrate Halloween because it was considered “evil” or “of the devil.” To this point I now disagree. I understand that if you look at the history of the day that it does have ties to different religions, several that do not believe in Jesus, but banning the kids from going to parties and such because the devil is going to take their souls really is a bit much. To each their own I guess, but as long you have peace with what you are doing then it isn’t any of my business whether you go trick or treating, have a church service, or just stay home and watch TV, which was my choice…. till next time. I have actually made my third day… I wanted to try out my watercolor pencils, but I also used markers and paint pens. She seems a bit pensive or in deep thought. I probably need to work on my proportions, as she is a bit off in places, but what the heck. I actually made it to day two of my face a day challenge to myself. I was trying out my new markers on this one. 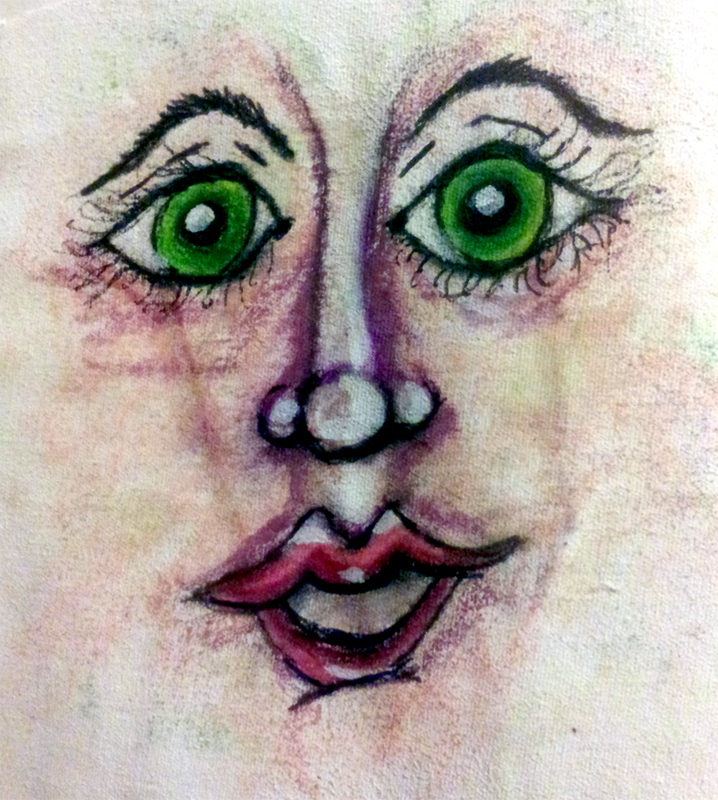 She ended up a bit strange, but It is my doodling. 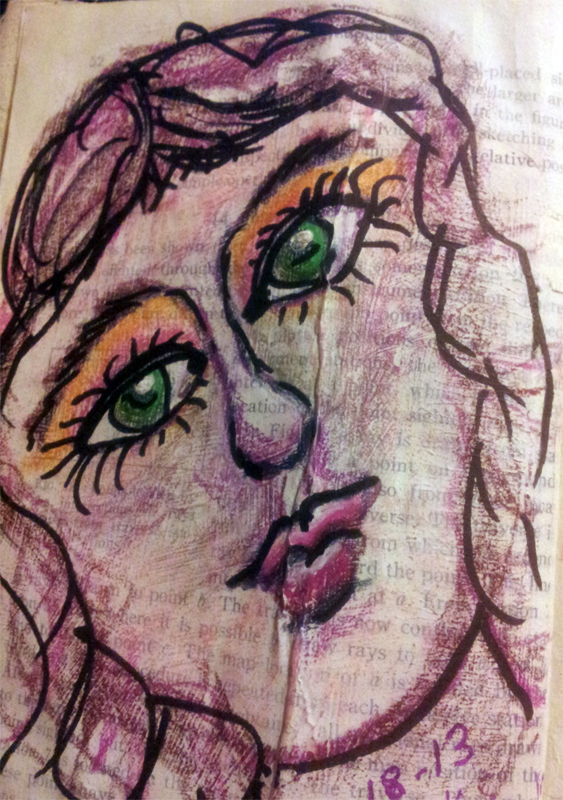 I have decided that I am going to draw a face a day. It doesn’t have to be in depth, realistic, or in color, but every day I am going to draw a face and then post them here. 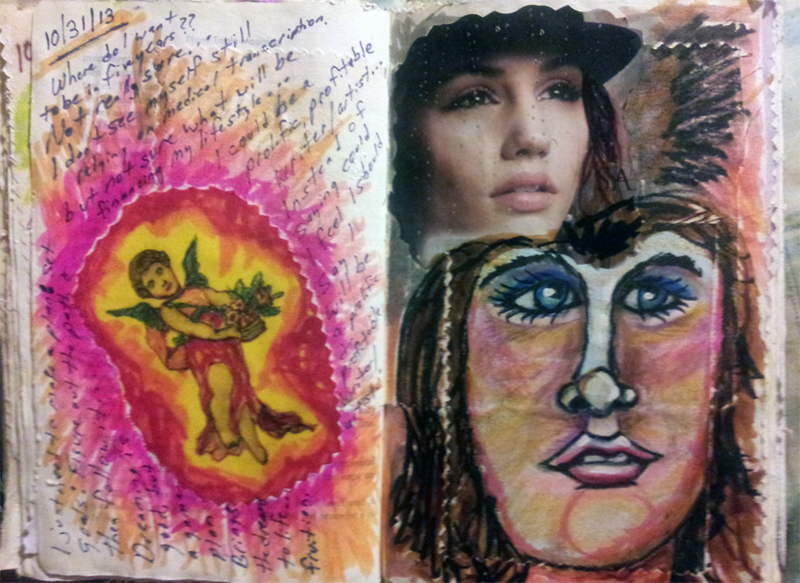 What started this idea was about a month ago I started an art journal. I am a fiber artist who specializes in art dolls, but also makes just about anything from cloth including wall hangings, rugs, and purses. I am working on a series of doll making books and one is dedicated on my method of face painting on both flat surfaces and soft sculptured faces. I am trying different methods and painting techniques I do not normally use. 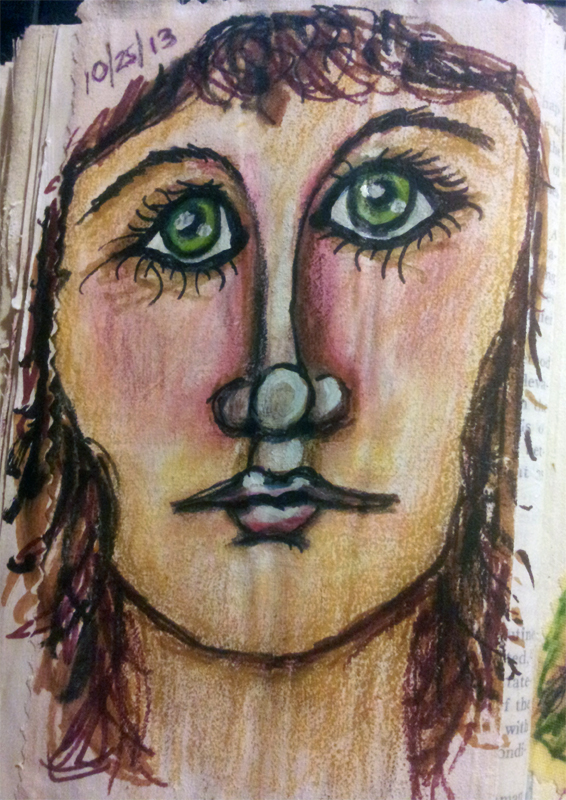 As I got farther into my art journal I thought it would be a great challenge for myself to do a face drawing a day. Hope you will join me on this journey. I will also be adding my own commentaries and rants among the pictures. I hope to post everyday, but if not will catch up the pictures on my next post. As a quick note, my art journal started as an old textbook that I thinned of some of the pages and then used gesso on all the pages. Some of the pages also had fabric glued on them so I could practice my drawing on the surface that I normally draw my faces on, i.e. 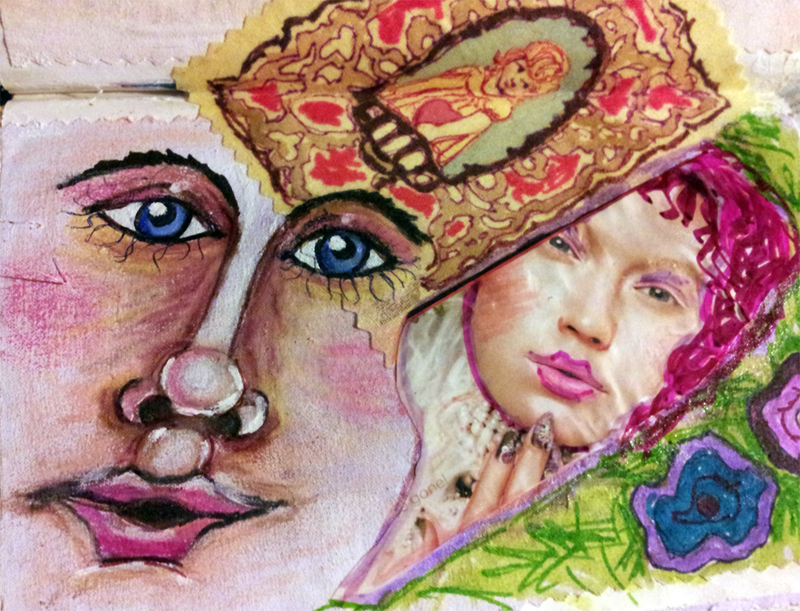 fabric art dolls. So far the journal has taken on a life of its own with everything from experimenting how to draw different types of flowers to just expressing my feelings through words and pictures. I have never been much of a journal keeper, but must admit this has become a regular part of my schedule and a way to channel my art and feelings out of my head and onto the paper… till next time…. 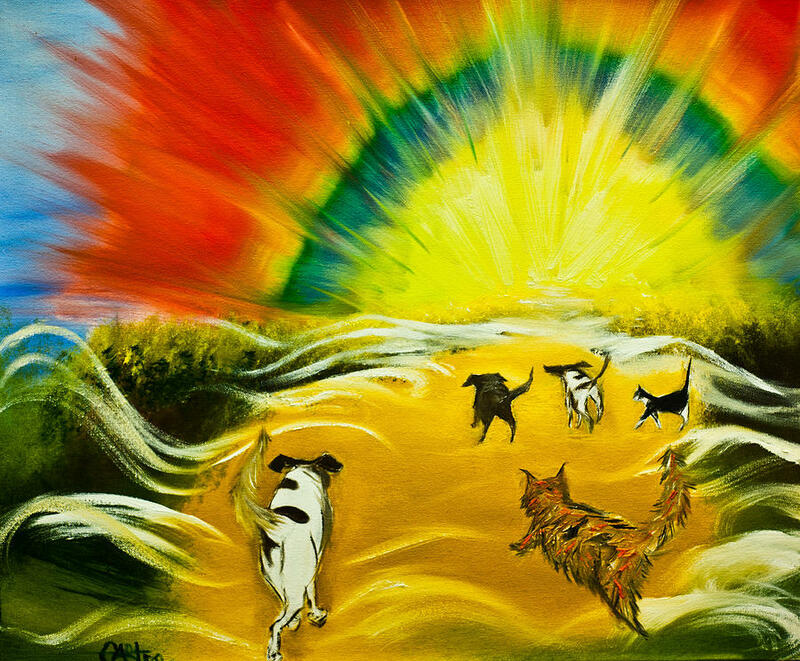 When do you know it is time to say goodbye to your pet?? Two weeks ago my dog Lady wasn’t feeling well. She is a pure-breed Chihuahua who has a brown and tan teddy bear face. I thought she was just constipated or such and figured a quick visit to the vet would make everything okay. Ends up she has a mass in her bowel area and it is probably cancer. The vet basically said we could spend thousands of dollars to treat it, but it really would not extend her life that long. I asked the vet the big question though and really did not get an answer. The question is when is it time to put her to sleep? She cannot talk. She cannot really communicate, so when is it time? Do we wait until we can tell she is in horrible pain, which I really don’t want her to live that way, or do you just say you do not have much time so let us do it now before you get that bad. It makes me feel like I am playing God with my dog. It is my decision on when, if, or how long she will be on the earth. I have had her since she was six weeks old. She has always been a house dog, sleeping with us, and adding something special to our lives, but at what point do I know and have peace with the decision that it is time to let her go? I guess what I find crazy is that we can decide when life ends for our pets, but we cannot do this for ourselves or our loved ones. People can tell us what is wrong, how much pain they are in, and if they are ready to leave this earth, but we cannot legally do anything to help them end their life. It just seems like as long as a person is of sound mind they should be able to make the same decision of whether they have to stay on this earth or not. 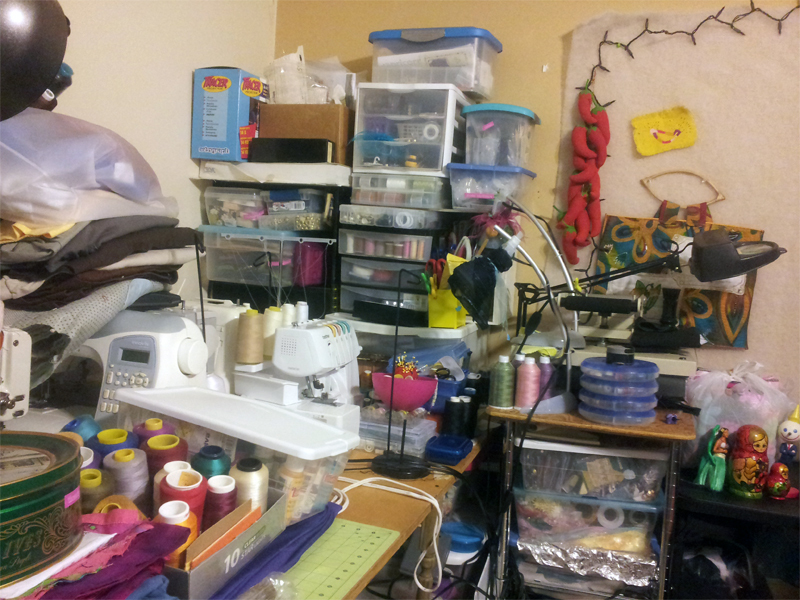 While sitting in my office/sewing room I took a look around and decided the room was getting just too full to do anything in it. 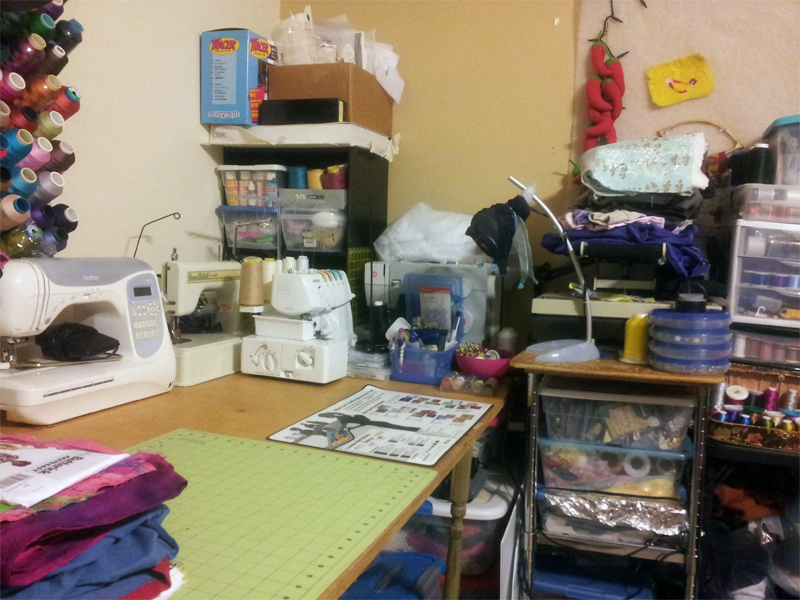 It used to be only my sewing room, but a few months ago I had to move my office in there also due to the cable internet setup, so the room then became two rooms in one. This wouldn’t have been too bad, other than it isn’t that big of a room to begin with and now it serves two purposes instead of one. I have to admit I didn’t buy all the fabric, notions, etc. that fill the room up. I have been given several tubs of supplies from my mentor who showed me how to make dolls a few years back, found free fabric on several of those free lists, or what I have bought has all be discounted, discontinued, or repurposed. 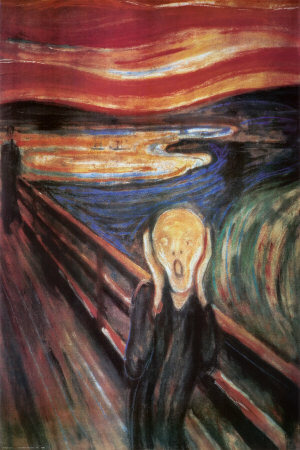 I’m back… Be afraid, very, very afraid…. I am fin ally back from my hiatus that turned from a couple of weeks to several months. I really did not mean to take so long to write a new blog post, but I guess life got away from me. I mean there has been several things to write about. Just in the last month you have had the government shutdown. The problem with this is the people who need the most help are the ones who are the most affected by the shutdown. I think if we could freeze the pay for Congress until they make a decision they would have come to an agreement weeks ago. I guess the problem is the only people who can do that is the Congress people, and I do not see them voting for a pay freeze anytime soon. We could talk about the Veterans who just told the government to stick it and went to the memorial anyway or the truckers who are telling the president to resign or any other of list of topics we could cover that is government related. I could go on about how my youngest who now hasn’t talked to me in over two years, which breaks down to three Mother’s Days, three birthdays, well, you get the picture. I found out from looking at his Facebook page that he graduated from college last month and if I had not seen the picture I would have never know. I went to all of his important functions for years, all his graduations, concerts, sports events, whatever, but now I have no idea what is really going on in his life. I could also talk about “the girls” and issues I have been having with them and how I wish I had a pretty bra or how I tried to start walking on a treadmill everyday to get ready for our upcoming 34th anniversary cruise in November and thought I was going to die after eight minutes. I really do not understand when I got so out of shape. I normally walk somewhere or do some type of physical activity on a daily basis, but guess since all the problems I have been having with my back I just haven’t been as active as I thought. This will be our first cruise ever and am kind of worried about all the walking I keep hearing we are going to have to do, but guess I will just have to make it work….